Draft: 2004, Oakland Athletics, C1th rd. Huston Lowell Street. Originally signed by Oakland scout Blake Davis. Attended Westlake (TX) HS and the University of Texas... Led Longhorns to three consecutive College World Series appearances and was named 2002 CWS Most Outstanding Player after saving four games, including the championship game against South Carolina… Named an All-Big 12 selection from 2002-04… His late father, James, was a star quarterback at Texas, winning 20 consecutive games at one point and leading the Longhorns to a national championship in 1969... James Street also posted a 29-8 record pitching for Texas, leading three UT teams to the College World Series. Played for US National Team following his 2002 and 2003 seasons at the University of Texas. Pitched for United States in 2006 World Baseball Classic. Led Angels, with nine saves...Finished year ranked 17th on all-ti me saves list, passing All-Stars Rick Aguilera, Todd Jones and Jose Mesa on all-ti me list...Converted all fi ve of his save opportuniti es prior to suff ering left oblique muscle strain in late April...Missed 32 games on disabled list...Opened the year with fi ve consecuti ve perfect appearances (4.1 IP), earning one win and three saves in the process...Earned only 4+ out save of season June 5 at Pitt sburgh...Missed fi nal 57 games of season on disabled list with right knee infl ammati on. In first full season with Angels, went 3-3 with a 3.18 ERA (62.1 IP - 22 ER) and converted 40 of 45 save opportunities. Became one of two pitchers to eclipse the 40 saves mark in each of last two seasons (also, Trevor Rosenthal, STL). Ranked second in American League in saves, behind only Tampa Bay's Brad Boxberger (41 saves). Became 27th player all-time to record 300 career saves July 22 vs. Minnesota. Was second youngest pitcher to reach the 300 career save mark (behind Francisco Rodriguez). Reached 300 save plateau in fifth fewest save opportunities (346) all-time. Ranks 20th on all-time saves list with 315... Passed 11 players on all-time list over the course of the season, including Hall of Famers Bruce Sutter (300 career saves) and Goose Gossage (310). Became third pitcher all-time to have recorded at least 150 saves in each league, joining former Angels closer Francisco Rodriguez and Jeff Reardon as the only other members of the 300-save club to have done it. Is fourth among active closers on all-time saves list behind Francisco Rodriguez (386), Joe Nathan (377) and Jonathan Papelbon (349). Earned the win for Angels May 5 & 6 vs. Seattle, becoming Halos first pitcher since Brendan Donnelly to earn a win on back-to-back days (July 30-31, 2004). Became first pitcher in Angels history to start a season with four consecutive perfect outings. Retired each of first 14 batters faced to open the season… First Angels pitcher to do so since Chuck Finley in 1991 (STATS LLC). Earned a save or win in each of first 11 appearances this year, which is tied for fourth longest Major League streak to start a season since 1969. Streak of eight games and eight IP were both longest of career to start a season without allowing a run. With strikeout of Brett Lawrie April 29, became eighth reliever since 2005 with 600 career strikeouts. On August 5, Huston and Lacey Street welcomed the birth of their third son, Rafe. Did not pitch in Angels final eight games of the year after suffering a season-ending groin injury September 26 vs. Seattle. Agreed to terms on a two-year contract extension with Angels May 13 with a club option for the 2018 season. 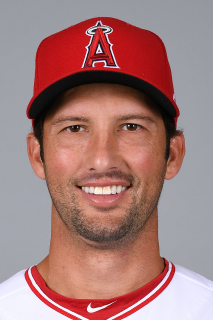 Posted a 2-2 record with 41 saves and a 1.37 ERA (59.1 IP - 9 ER) in 61 games in 2014 with Padres and Angels...Set new career-high with 41 saves (previous high was 37 saves in 2006 for Athletics)...Acquired by Angels from San Diego on July 18 with minor leaguer RHP Trevor Gott in exchange for minor leaguers INF Taylor Lindsey, RHP R.J. Alvarez, INF Jose Rondon and RHP Elliot Morris...In 28 games with Angels, went 1-2 with 17 saves and a 1.71 ERA (26.1 IP - 5 ER)...Did not allow a run in 25 of 28 appearances with Halos...Began Angels career with a streak of 12 straight scoreless outings...His 1.37 overall ERA ranked third among Major League relievers and was tops among closers...55 of his 61 appearances were scoreless this season between Padres and Angels...In 33 appearances with San Diego, went 1-0 with 24 saves and a 1.09 ERA (33 IP - 4 ER)...Recorded 34 strikeouts while walking seven...Named to National League All-Star team but did not appear in All-Star Game in Minnesota. His 33 saves (in 35 chances) ranked tied for the seventh in the National League while his 94.3 save percentage ranked tied for second in the National League and tied for third in the Majors behind Miami's Steve Cishek (94.4) and Toronto's Casey Janssen (94.4)...Named the Padres' Darrel Akerfelds Bullpen Award winner...Was 2-1 and 18-for-19 in save opportunities with a 0.89 ERA (3 ER, 30.1 IP) with 31 strikeouts in his final 31 relief appearances (June 26-end of season)...began the season with a 0-4 record and a 4.78 ERA (14 ER, 26.1 IP) with 15 strikeouts in his first 27 relief appearances...Was named National League Player of the Week (September 2-8), the second such honor of his career (also June 14, 2009 while with the Rockies)...His 0.89 ERA from June 26 through the end of the season ranked third in the National League and seventh in the Majors amongst relievers (min. 25.0 IP)...Was 25-for-25 in save opportunities between May 14 and September 23…during that stretch posted a 0.36 ERA (1 ER, 25.1 IP) with 23 strikeouts in save opportunities… the 25 consecutive saves was the second-longest streak of his career, behind only the 26 consecutive saves he had from June 8-September 27, 2009...could not convert his final save chance of the year in the season's final game on September 29 at San Francisco...Recorded 30+ saves for the third time in his career (2006, 2009)...recorded 20+ saves for the seventh time in his nine Major League seasons...Tossed 20.1 consecutive scoreless innings (June 26-September 3), limiting opposing hitters to a .119 (8-for-67) batting average. In his first season with the Padres, posted the best save percentage among all qualifying National League closers, going 23-for-24 in save opportunities, while also being honored with his first career All-Star selection. His 95.8 (23-for-24) save percentage ranked second-best overallamong qualifying Major League relievers and was the third-bestamong qualifying relievers in Padres franchise history (Rod Beck,100.0 in 2003 and Trevor Hoffman, 98.1 in 1998).Named to the 2012 National League All-Star team.Posted a career-best 21.1 scoreless innings streak from 6/20-8/10, second-longest streak by a Padres pitcher in 2012 behind Luke Gregerson's 23.0 scoreless innings streak.Converted 23-straight save opportunities from the start of the season up until his last outing, the second-longestsave streak by a National League reliever in 2012 (Aroldis Chapman, CIN, 27-straight saves converted).Began the season by posting a 0.93 ERA (1 ER/9.2 IP) and 13 strikeouts against just two walks and three hitsallowed in his first 10 outings before landing on the 15-day DL on 5/5 with a strained right lat.Made two relief appearances on a rehab stint with Single-A Lake Elsinore before being reinstated from the DL on 6/5.Went 2-0 with a 0.68 ERA (2 ER/26.1 IP), 17 saves in 17 chances and 32 strikeouts against just six walks andeight hits allowed for a .093 (8-for-86) opponents batting average from 6/5-8/10 after being reinstated from the DL.Placed back on the 15-day DL on 8/11 with a strained left calf...reinstated on 9/21 and worked in three final gamesfrom 9/21 through the end of the season.Had his first and only blown save of the season in his last outing of the year on 9/30 vs.SF, allowing two home runsand a season-high three runs total, his only home runs allowed in 2012 and his only game allowing multiple runs.Pitched on zero days of rest 11 times in 2012, converting all nine of his save opportunities on such occasions andnot allowing a run in his 11.0 innings of work on those days.Agreed to terms on a contract extension through the 2014 season with a club option for 2015 on 7/29. Converted 29 of 33 save opportunities over 62 relief outings for the Rockies, topping 60 appearances for the fifth time in his career...Named MLB Delivery Man of the Month for April after leading the Majors with 10 saves in 10 opportunities...posted a 2.20 ERA (4 ER/16.1 IP) with 17 strikeouts in 15 April appearances...Picked up 26 of his saves prior to the All-Star break (26-for-28) and just three after the break (3-for-5)...made only 19 appearances after the break...Spent 12 games on the 15-day disabled list from 8/12-26 with a strained right triceps...Posted a 2.15 ERA (7 ER/29.1 IP) in his 30 road outings, converting 18 of 20 save opportunities...Finished the season with his third-highest save total and fifth-best save percentage in Rockies history...moved into third place on the Rockies all-time saves list with 84. Spent his second full season with the Rockies but missed the first 69 games of the season on the 15-day disabled list with an inflamed right shoulder...was reinstated from the disabled list on 6/22...made hisfirst appearance of the season in a non-save opportunity tossing 1.1 innings...Recorded 20 saves in 25 save opportunities...is his second straight season with at least 20 saves andfourth career 20-plus save season...Converted his first six saves of the season from 6/29 to 7/18 before blowing his first save 7/19 at FLA...Tossed 3.0 straight perfect innings to earn three saves with three strikeouts and just 32 pitches, 8/22-24...Saved five games in nine days 9/3, 5, 7, 9 and 11 allowing just five hits, one walk and no runs while strikingout eight over those five...Finished the season saving 11 of 12 opportunites allowing 11 hits and two runs over 13.0 innings (1.38ERA) in those 12 save opportunities...struckout 15 and walked just two over that span...Tossed 2.0 innings of one-hit relief 7/4 to set his season-high for innings pitched at the time...in that samegame he also struckout in his first Major League plate appearance...His seven saves in the month of August were tied for fourth in the National League...his eight saves from8/30 to 9/17 were tied for the most in the Majors over that period...Held left-handed hitters to a .208 (15-for-72) average and right-handers to a .238 (24-for-101) averagefor an overall average of .225 (39-for-173)...career has held righties to .208 average and lefties to .218...Currently sits fourth on the Rockies all-time saves list with 55 saves in the two full seasons as aRockie...his 88.7 save percentage (55-for-62) is the best in Rockies history. In his first season with Colorado, finished4-1 with 35 saves and a 3.06 ERA (61.2 ip, 21er)...led Rox pitchers in saves and his 4 wins led allRox relievers...recorded his highest save total (35)since earning a career-high 37 saves in 2006;marked just the 7th 30-save season in franchise history,and is just the 5th player to accomplish that featin a Rox uniform...converted 26 consecutive saveschances (from June 8-Sept. 27), which was the longest streak by an NL pitcher in '09; it surpassed his personalcareer-best save conversions streak (21, 7/19/05-4/15/06), while also setting the Rockies club record(previously: Brian Fuentes, 21: 7/25/05-4/27/06)...Street's 94.6 save pct. is the highest mark in franchisehistory, ahead of Brian Fuentes' mark of 91.2 (31-for-34) in 2005; his save pct. also was the 2nd-best markby NL pitchers, trailing only Washington's Mike MacDougal...had 22 first-half saves and finished just onesave shy of the Rockies franchise record for saves prior to the All-Star break (23, Jose Jimenez in2002)...was slowed by injury late in the second half, as he did not pitch from 9/2-21 due to right biceps tendinitis...had 70 strikeouts vs. just 13 walks; recorded a 5.38 strikeout/walk ratio, the 2nd-best mark byNational League relievers (trailing only Chad Qualls, 6.43)...struck out 3 batters during a 1.0-inning save onoccasions (4/29 vs. SD, 5/15 at PIT, 6/10 at MIL, 9/24 vs. SD)...allowed a .194 opp. batting avg, along witha .236 opp. on-base pct. - the 2nd-lowest mark by MLB relievers...only 15 of his 43 hits allowed went forextra-bases, including 6 home runs (no triples allowed)...posted a 2.11 ERA (38.1 ip, 10 er) in his 37 gameswith a save opportunity, while logging a 4.63 ERA (23.1 ip, 12 er) when there was no chance for a save...hadan average of 14.1 pitches thrown per save (492 pitches in his 35 saves); tossed 29 pitches for the save6/18 vs. TB (high) and 5 pitches (low) in a 1.0-inning save 6/21 vs. PIT; 5 pitches are the fewest he everneeded in a 1.0-inning save in his career....allowed runs just 5 times while also converting the save...pitchedmore than one inning for the save just 3 times, all of which took place between Aug. 16 and the end of theseason (1.1 ip for the save 8/16 at FLA, 2.0 ip for the save 9/27 vs. STL, 1.1 ip for the save 10/2 at LAD);the 2.0 innings for the save on 9/27 was his 3rd career 2.0-inning save (also: 8/2/06 at LAA; 6/3/06 vs.MIN)...had just one save in which he did not pitch a full inning, 6/11 at MIL (0.2 ip)...the Rox went 52-12 ingames he appeared in, including going 38-2 in his final 40 games...competed with Manuel Corpas for thecloser role during Spring Training and briefly lost his job in that role at the end of April (0-1, 6.10 ERA for themonth); posted a season-best scoreless streak (13.0 ip) from 4/26-5/29 (a span of 14 games)...had a win ora save in 13 of his 14 appearances from 5/30-6/28....Street saved all 3 games in the Rox series at Oaklandto become the 4th ex-A's pitcher to save at least 3 games in a season against his former team (also RollieFingers-1984 Brewers, Ernie Camacho-1984 Indians and Jeff Russell-1993 Red Sox, '95 Rangers); Streetis the only one of them with saves against Oakland in each of 3 consecutive games...was named the NLCo-Player-of-the-Week for week ending 6/14 (1.93 ERA, 5 games, 5 saves); his first career weekly honor. Began the season as the A's closer but had a rough stretch after the All-Star break and was replaced by Brad Ziegler on 8/8...led the A's with 18 saves but also had 7 blown saves and his save per- centage of 72.0% was second lowest in the AL to Seattle's J.J. Putz (65.2%)...it was the 4th lowest save pct. in Oakland history and the lowest since Jay Howell had a mark of 66.7% (16 for 24) in 1987...now has 27 blown saves over the last four years, which are the most in the AL and 2nd most in the Majors (Cordero, 32)...has converted 94 of 121 (77.7%) career save opportunities and he ranks 4th on the A's career saves list...tied for 11th in the AL in saves in 2008 but was tied for 3rd in blown saves...compiled a 7-5 record and a 3.73 ERA in 63 appearances...had career highs in wins, losses, ERA, runs (29), earned runs (29), home runs (6), walks (27), opponents on-base percentage (.303) and opponents slugging percentage (.368)...tied for 3rd among AL relievers in wins and tied for 6th in losses...5 of his 7 wins came after the All-Star break and he led the A's in post-break wins...had 69 strikeouts, 2nd most in his career...now has 271 strikeouts and 78 walks in 269.0 career innings for a strikeout to walk ratio of 3.47...first batters faced were 11 for 59 (.186) with four walks and he allowed just 2 of 13 (15.4%) inherited runners to score...allowed a .229 oppo- nents batting average, including .200 (21-for-105) against left-handed hitters and .250 (37-for-148) against right-handers...allowed 5 of his 6 home runs against left-handers and 14 of his 18 career home runs have been hit by lefties...5 of his home runs came in home games, 5 were solo shots and all 6 came before the break...opponents hit .232 w/RISP, but that jumped to .300 with RISP and two outs and opponents were 3- for-6 (.500) with 7 RBI with the bases loaded...tossed at least 1.0 inning in 58 of his 63 outings, including five outings of 2.0 innings...was charged with the blown save and loss on Opening Day in Japan 3/25 vs. BOS when he allowed the game-tying homer to Brandon Moss in the top of the 9th before allowing 2 more runs in the 10th inning of a 6-5 A's loss...allowed one home run in each of his first three outings and also allowed a home run in his final outing of 2007 (the only other reliever in Oakland history to allow a home run in four consecutive games is Vida Blue from 8/24-9/7, 1969...recorded his first save of the season on 4/8 at TOR and converted all nine of his save opportunities while posting a 0.84 ERA over a 10-game stretch from 4/8-5/4...that was the 2nd longest streak of consecutive saves in his career...was charged with his 2nd blown save 5/5 against Baltimore but would get just four save chances over the A's next 38 games through 6/19; converted all four of those chances... made 200th career appearance on 5/15 at CLE and became the 24th pitcher in Oakland history to pitch in 200 games...had career-high 5 strikeouts on 5/19 against TB...allowed 2 home runs in a game for the second time in his career on 6/20 against FLA but did not allow another home run the rest of the season for a 33-game, 37.1-inning, 161-batter homerless streak...tossed 1.2 innings for the save on 7/3 at CWS...it was his 17th career save of more than three outs and his 8th of five outs or more...went 0-3 with a save, 3 blown saves, an 8.71 ERA, a .419 opponents bat- ting average and nine walks in 10.1 innings over a 10-game stretch from 7/12-8/10...was charged with the blown save in consecutive outings on 7/13 and 7/19 and had his 6th blown save of the season 8/5 at TOR...that would be his final 9th-inning save opportunity of the season...entered the game in the 5th inning on 8/10 at DET and allowed 3 runs on 3 hits in 1.0 inning...it was the first time in his career he entered the game in the 5th inning and just the 5th time he entered the game before the 7th inning...then went 5-0 with one blown save, a 1.37 ERA and .152 opponents batting average over his final 17 games. Missed two months with a midseason stint on the disabled list and appearedin just 48 games, his fewest in his three seasons in the Majors...was5-2 with 16 saves and a 2.88 ERA...the saves were also the fewest of hiscareer and he tied for 13th in the American League in saves...converted 16of 21 (76.2%) save opportunities and had the lowest save percentage amongAL closers...it was the lowest save percentage by an A's closer since DennisEckersley went 19 for 25 (76.0%) in 1994...his five blown saves tiedfor eighth most in the AL, but the A's came back to win three of thosegames...has 20 blown saves over the last three years, the most in the ALover that span, but the A's have an 11-9 record in those games...now has76 career saves, which is fourth most in Oakland history...it is fifth mostin Major League history by the age of 24...struck out 63 batters in 50.0innings, an average of 11.34 strikeouts per nine innings, which rankedthird among AL relievers...issued just 12 walks and his strikeout to walkratio of 5.25 was fifth best among AL relievers...tied for eighth in fewestwalks per nine innings (2.16)...now has 202 strikeouts and 51 walks in199.0 career innings...allowed a .190 opponents batting average and a.239 opponents on-base percentage, both of which were careerlows...ranked fifth among AL relievers in on-base percentage and ninth inbatting average...allowed a career high five home runs and matched hiscareer high with five wins...his opponents batting average included a .162(16 for 99) mark against right-handed hitters and .224 (19 for 85) againstleft-handers...issued just two of his 12 walks to right-handers for a .178on-base percentage...surrendered four of his five home runs to lefthanders...now has a .209 career opponents average, including .184 (75 for408) by righties and .242 (77 for 318) with nine of his 12 career home runsby lefties...four of his home runs in 2007 were solo shots...first battersfaced were 10 for 46 (.217) with two walks and he allowed 2 of 5 (40.0%)inherited runners to score...converted 11 of 12 (91.7%) save opportunitiesin his 17 outings on no days rest and 5 of 9 (55.6%) in his other 31outings...in his career, he is 35 for 40 (87.5%) in saves chances on no daysrest and 41 for 56 (73.2%) on one or more days rest...compiled a 1.64ERA and .162 opponents batting average in 30 outings at night while going3-0 with 12 saves in 14 opportunities...had a 5.29 ERA and .239 opponentsbatting average in 18 outings during the day and was 2-2 with 4 saves in 7 chances...allowed four ofhis five home runs during daygames. Tossed at least one inning in45 of his 48 outings and pitched exactlyone inning 41 times...recordedthe decision in three straight gamesfrom April 10 to 13 to become just thefourth pitcher in Oakland history to dothat...joins Rollie Fingers (September10-11, 1972), Jay Howell (June 9-11,1985) and Billy Koch (September 1-4, 2002)...had two wins and a lossduring the stretch...matched his careerhigh by issuing three walks in 0.2 inningsin a loss to Chicago on April11...was charged with his secondblown save of the season on May 5 at Tampa Bay when he allowed aleadoff home run to Ty Wigginton in the bottom of the ninth...the homerun snapped a 51-game, 52.0-inning, 215-batter homerless streak datingback to June 24, 2006 at San Francisco...was 2-1 with nine saves, twoblown saves, a 2.50 ERA and a .148 opponents batting average in 18 appearancesthrough May 12...was placed on the 15-day disabled list onMay 15, retroactive to May 13, with an irritation of the right ulnarnerve...made one rehab appearance with Triple-A Sacramento on July 21against Salt Lake (1.0 ip, 1 h, 2 so) and was reinstated from the DL on July23...went 3-1 with seven saves, three blown saves, a 3.09 ERA and .211opponents batting average in 30 outings following his return...worked as asetup man immediately following his return from the DL...matched hiscareer high by allowing four runs in 0.2 innings on July 29 at Seattle andtook the loss...recorded at least one strikeout in 19 consecutive appearancesfrom July 29 to September 5, equaling the third longest such streakby a reliever in Oakland history...had 34 strikeouts in 20.2 innings overthat stretch (14.81 per nine innings)...retired a season high 15 consecutivebatters from August 8 to 15...resumed his role as the A's closer on August15 and went 3-0 with seven saves, three blown saves, a 2.95 ERA and .198opponents batting average over his final 19 games...had a career high tyingfour strikeouts and retired all six batters that he faced in a season high2.0 innings on August 27 against Toronto...was charged with the blownsave in back-to-back outings on August 29 against Toronto and August 31against Detroit...the A's came back to win both games...put together aseason best 8.1 inning scoreless streak from August 31 to September 14and did not allow an earned run over an 11.1 inning stretch through September28...allowed one run in the final game of the season to finish Septemberwith a 0.95 ERA in 11 outings. Street tied for fourth in the American League with a career-high 37 saves, despite missing 12 games in April and 17 games in August and September. It was the seventh-best single-season save total in Oakland history. Street was 37 of 48 (77.1 percent) in save opportunities, lowest in the American League. Street, 23, recorded the third-most saves by a reliever who was 23 years old or younger. His 11 blown saves were the second most in the Oakland history since Rollie Fingers had 15 in 1976. He walked 13 batters and struck out 67 in 70 2/3 innings. He ranked seventh among AL relievers in fewest walks per nine innings (1.66). He allowed 7 of 30 (23.3 percent) inherited runners to score, which ranked eighth lowest in the AL. Missed 12 games from April 12-May 1 with a strained right pectoral minor muscle, and was placed on the disabled list with a strained right groin from Aug. 20-Sept. 8. Was named American League Rookie of the Year by the Baseball Writers Association of America after leading all Major League rookies with 23 saves...became the sixth Oakland Athletic to win the award, joining Jose Canseco (1986), Mark McGwire (1987), Walt Weiss (1988), Ben Grieve (1998) and Bobby Crosby (2004)...is just the third closer to be named AL Rookie of the Year, joining Gregg Olson (1989) and Kazuhiro Sasaki (2000)...was also named AL Rookie Player of the Year by The Sporting News, received the Players Choice Award for the AL's Outstanding Rookie and was named Rookie of the Year by Baseball America...the 22-year old rookie took over as the A's closer following the injury to Octavio Dotel in May and set the Oakland rookie record for saves, breaking the mark of 12 set by Rollie Fingers in 1969...his 23 saves tied for seventh most ever by an AL rookie and were fourth most ever by a player 22 years old or younger...tied for second among AL rookies in appearances (67), ranked eighth in strikeouts (72), ninth in wins (5) and was 10th in innings pitched (78.1)...his 67 appearances were second most ever by an Oakland rookie to the record of 71 set by Aaron Small in 1997...was 5-1 with a 1.72 ERA and .194 opponents batting average...ranked second among all AL relievers in ERA to Mariano Rivera (1.38) and his ERA was third lowest in Oakland history based on a minimum of 70 innings pitched...also ranked tied for seventh among AL relievers in innings and was ninth in opponents batting average...converted 23 of his 27 (85.2%) save opportunities which ranked eighth among AL closers...was 11th in saves...was 5 for 9 (55.6%) in save opportunities before the All-Star Break, recording his fourth blown save in his final outing before the break on July 10 at Chicago...then went on to convert each of his 18 save opportunities after the break and tied for fifth in the AL in post-ASB saves...his streak of 18 consecutive saves converted is tied for the fifth longest such streak in Oakland history...the last A's closer with more than 18 straight saves is Dennis Eckersley who set the Oakland record with 40 consecutive saves from September 15, 1991 to August 7, 1992...allowed just three home runs in 78.1 innings, an average of 0.34 per nine innings, which ranked ninth lowest among AL relievers...allowed five runs in his first seven outings for a 4.32 ERA (4 er in 8.1 ip)...then did not allow a run in 24 of his 27 outings from April 23 to July 8 for a 0.57 ERA (2 er in 31.1 ip) and .149 (15 for 101) opponents batting average...allowed two runs on July 10 but then did not allow a run in 20 of his first 21 outings after the All-Star Break for a 0.36 ERA (1 er in 24.2 ip) and .131 (11 for 84) opponents batting average...that dropped his ERA to a season low 1.20 on September 6 but he allowed six runs over his final 11 outings (6 er in 10.2 ip, 5.06 ERA) to finish with a mark of 1.72...had four scoreless streaks of 10 or more innings, including 14.0 from July 10 to August 5, 11.2 from May 30 to July 5, 11.2 from August 13 to September 6 and 11.0 from May 4 to 26...his .194 opponents batting average broke down to .172 (27 for 157) against right-handers and .224 (26 for 116) against left-handers...allowed a .225 on-base percentage and .210 slugging percentage against righties and .321 and .345 respectively against lefties...yielded a .267 slugging percentage and .267 on-base percentage overall...opponents hit .194 (13 for 67) with runners in scoring position...first batters faced were 15 for 64 (.234) with three walks and he allowed two of his three home runs to the first batter he faced in an outing...allowed 9 of his 36 (25.0%) of his inherited runners to score...was 4-0 with 15 saves and a 1.43 ERA (7 er in 44.0 ip) in 37 outings when pitching on one day rest or less and 1-1 with eight saves and a 2.10 ERA (8 er in 34.1 ip) in his other 30 outings...was on the A's Opening Day roster and made his Major League debut on April 6 at Baltimore (1.0 ip, 1 h, 1 bb, 1 so)...entered the game to start the eighth inning and later struck out Sammy Sosa with runners on first and second for his first strikeout...became the first Athletic to make his ML debut within a year of being drafted since Ariel Prieto went straight to the Majors in 1995...struck out a season high four batters on April 11 against Toronto...recorded his first ML win on April 17 against Los Angeles by tossing two scoreless innings in the A's 7-6 win...was charged with blown saves on April 13 against Toronto and May 17 against Boston but both of those came before he took over as the A's closer...was 1-1 with a 2.01 ERA (5 er in 22.1 ip), no saves and two blown saves over his first 19 games through May...replaced Dotel as the A's closer on May 20 and went 4-0 with a 1.61 ERA (10 er in 56.0 ip) while converting 23 of his 25 (92.0%) save opportunities over his final 48 outings...allowed just 3 of 19 (15.8%) inherited runners to score over that span...recorded his first save on June 2 against Toronto, retiring three of four hitters in the ninth inning of the A's 5-3 win...tossed more than one inning in each of his next three saves and recorded more than three outs for seven of his 23 saves...had four four-out saves and three five-out saves...missed 12 games from June 15 to 27 with a strained left hamstring...allowed his first home on July 10 at Chicago, snapping his career opening homerless streak at 34 games, 40.0 innings and 156 men faced...the home run was a leadoff home run by Paul Konerko in the bottom of the ninth inning with the A's leading 8-6 and he allowed another run in the inning for the blown save...ended up with the win after pitching a career high 3.1 innings in the A's 9-8 victory in 11 innings...had a streak of 13 games, 17.2 innings and 67 batters faced without a walk from June 10 to July 27...recorded the save in six consecutive outings from August 1 to 13, including August 5 at Kansas City when he picked up his 13th save to break the Oakland rookie save record of 12 set by Fingers...stranded all 16 of his inherited runners over a 37-game span from May 22 to September 7. Made his professional debut and pitched at all three levels in the Oakland farm system...was a combined 1-1 with eight savesand a 1.38 ERA (4 er in 26.0 ip) in 21 relief appearances with Single-A Kane County, Double-A Midland and Triple-ASacramento...did not allow a home run in 26.0 innings...walked just eight while striking out 30...held the opposition to a .223(21 for 94) batting average...had two saves and did not allow a run in four postseason appearances for Sacramento (5.0 ip, 5h, 1 bb, 5 so)...then went on to pitch for the Arizona Fall League Champion Phoenix Desert Dogs and was 1-0 with a 0.98 ERA(2 er in 18.1 ip) and seven saves in 13 appearances...led the AFL in saves and tied for the lead in ERA...walked two and struckout 19 in 18.1 innings while allowing one home run...allowed a .180 opponents batting average...made a grand total of 38professional (regular season, postseason, Arizona Fall League) appearances in 2004 and was 2-1 with 17 saves and a 1.09ERA (6 er in 49.1 ip)...walked 11, struck out 54 and allowed just one home run in 49.1 innings...signed with the A's on July15 after being selected as a compensation pick following the first round of the June draft...during the regular season, heallowed a .081 (3 for 37) batting average against left handed hitters and .316 (18 for 57) against right-handers...opponentswere 4 for 25 (.160) with runners in scoring position...began his professional career at Kane County and was 0-1 with foursaves and a 1.69 ERA in nine games...struck out the side in his first outing on July 20 at Clinton...matched his season highwith three strikeouts in his next outing on July 23 at Clinton...recorded his first professional save on July 25 against FortWayne...was promoted to Midland on August 12 and was 1-0 with three saves and a 1.35 ERA in 10 appearances...did notallow a run in his final five Double-A outings (6.2 ip, 4 h, 2 bb, 8 so)...including August 29 at Arkansas when he tossed a seasonhigh 2.0 shutout innings for his first professional win...moved up to Triple-A Sacramento on September 5 and recordedone save in two regular season games with the River Cats (2.0 ip, 2 h, 2 so). November 3, 2017 RHP Huston Street elected free agency. August 29, 2017 Los Angeles Angels transferred RHP Huston Street from the 10-day disabled list to the 60-day disabled list. Right groin strain. July 5, 2017 Los Angeles Angels placed RHP Huston Street on the 10-day disabled list. Right groin strain. June 22, 2017 Los Angeles Angels activated RHP Huston Street from the 60-day disabled list. June 16, 2017 Los Angeles Angels sent RHP Huston Street on a rehab assignment to Salt Lake Bees. June 14, 2017 Los Angeles Angels sent RHP Huston Street on a rehab assignment to Inland Empire 66ers. May 24, 2017 Los Angeles Angels sent RHP Huston Street on a rehab assignment to Salt Lake Bees. April 17, 2017 Los Angeles Angels transferred RHP Huston Street from the 10-day disabled list to the 60-day disabled list. Right lat strain. April 1, 2017 Los Angeles Angels placed RHP Huston Street on the 10-day disabled list retroactive to March 30, 2017. Right lat strain. November 7, 2016 Los Angeles Angels activated RHP Huston Street from the 60-day disabled list. September 4, 2016 Los Angeles Angels transferred RHP Huston Street from the 15-day disabled list to the 60-day disabled list. August 2016 right knee surgery. August 2, 2016 Los Angeles Angels placed RHP Huston Street on the 15-day disabled list retroactive to August 1, 2016. Right knee inflammation. May 30, 2016 Los Angeles Angels activated RHP Huston Street from the 15-day disabled list. July 19, 2014 Los Angeles Angels activated RHP Huston Street. June 14, 2013 San Diego Padres activated RHP Huston Street from the 15-day disabled list. June 12, 2013 San Diego Padres sent RHP Huston Street on a rehab assignment to Lake Elsinore Storm. June 1, 2013 San Diego Padres placed RHP Huston Street on the 15-day disabled list retroactive to May 30, 2013. Strained left calf muscle. September 21, 2012 San Diego Padres activated RHP Huston Street from the 15-day disabled list. August 11, 2012 San Diego Padres placed RHP Huston Street on the 15-day disabled list. Strained left calf. June 5, 2012 San Diego Padres activated RHP Huston Street from the 15-day disabled list. June 1, 2012 sent RHP Huston Street on a rehab assignment to Lake Elsinore Storm. December 7, 2011 Colorado Rockies traded RHP Huston Street to San Diego Padres. August 26, 2011 Huston Street roster status changed by Colorado Rockies. August 22, 2011 sent RHP Huston Street on a rehab assignment to Colorado Springs Sky Sox. August 12, 2011 Colorado Rockies placed RHP Huston Street on the 15-day disabled list retroactive to August 9, 2011. Right triceps strain. June 22, 2010 Colorado Rockies activated RHP Huston Street from the 15-day disabled list. June 4, 2010 sent RHP Huston Street on a rehab assignment to Colorado Springs Sky Sox. May 13, 2010 sent RHP Huston Street on a rehab assignment to Tulsa Drillers. April 3, 2010 Colorado Rockies placed RHP Huston Street on the 15-day disabled list retroactive to March 26, 2010. Right shoulder inflammation.